LaToya Ruby Frazier’s photographs are both intensely personal and assertively political. Approaching the documentary tradition with a tenderness that never offsets the forcefullness of her intent, Frazier documents the effects of deindustralisation, environmental degradation and entrenched racial discrimination on the African American population of the USA. Her work is diaristic and often hinges on the intimate fabric of the everyday. A collective story of systemic political negligence and racially charged prejudice is told through the quiet corners of family life. Generational resilience is written into her densely layered photo-essays; visible in the corners of cluttered houses and the bonds that tie her protagonists together. In her work, Frazier does not ‘bear witness’ by holding her subject at arm’s length. Instead, she is herself implicated in every image – whether she is documenting her hometown or the Flint water crisis. Flint is family (2016) is not an impassive portrayal of an environmental crisis; it is a sensitive study of a family with whom Frazier spent five months living without access to clean drinking water. It is Frazier’s own family, however, that drives her most important body of work. Begun when she was only sixteen, Frazier’s The notion of family is a portrait of the maternal space. Three generations of Frazier women – including the artist – populate a sequence of images taken in and around the family home in Braddock, Pennsylvania, a once thriving steel mill town. The series is at once a chronicle of the erosion of American idealism – accelerated by the fallout from a near-extinct industrial economy – and an archive of family life. 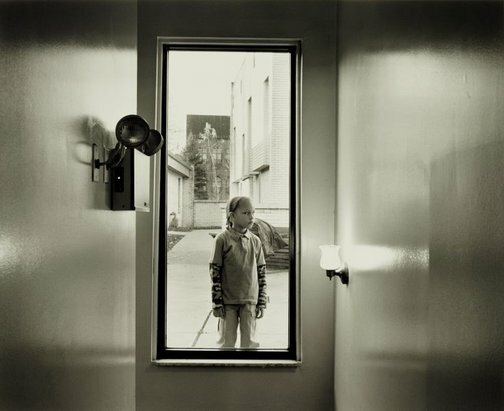 This photograph shows a child framed by a window that looks out onto a bleak and austere courtyard. The child looks through the window directly at the camera. With an expression that could be self-assured or apprehensive, the child seems to possess a wisdom that far surpasses age. Frazier has titled this image Self-portrait at 40 Holland Avenue but her own face is nowhere to be seen. The child, the only figure that we can attribute this self-identifying moniker to, is in fact Frazier’s first cousin once removed, JC who, like the artist, was raised by Grandma Ruby. JC, though a boy, is used as a surrogate for the artist in many images throughout the series. Through him, the artist can fold her own childhood into a scene. Across the suite of photographs, taken over thirteen years, bodies and familial relationships morph and change. In this image, the artist locks eyes with her own stand-in and the linearity of generational time becomes a closed circle.